Ozone and other oxygen therapies have been used for over 100 years around the world for human and animal healing. These therapies continue to gain popularity, as scientists learn about the health benefits of increased oxygen in the body. Currently, ozone therapy brings easily soluble oxygen to target tissues, and it is being proven effective for treating viruses, fungi and bacteria, and for general health improvement anytime there is inflammation and damaged tissue. In addition to medical uses, ozone is a great disinfectant used for livestock water tanks, cattle embryo transfer, swimming pools, spas and the water treatment systems of over 2,000 municipalities around the world. The procedure adds oxygen to tissue, which promotes microcirculation. If we can bring more oxygen into the body, especially into areas that are inflamed, we can alleviate that inflammation. We can also reduce cancer cells, because cancer doesn't like oxygen and doesn't thrive in an oxygenated environment. Anywhere we use saline on an animal, we can use oxygenated fluids. We can flush the mouth before dental procedures and it gets rid of the whole biofilm of the mouth. It eliminates the need for antibiotics. Ozone therapy is also wonderful for infections as well as swelling, bruising and trauma. We can flush the ears, the eyes, and the prepuce (foreskin). We can use it on the skin. We can soak wounds. We can give it as an enema for an obstipated animal. We can flush the bladder in an animal with a urinary tract obstruction. Ozone therapy works for autoimmune disease as well, because it allows the mitochondria to work efficiently. When we give ozone, we're increasing oxygenation at the level of the mitochondria. It's amazing how something so simple – an extra oxygen molecule added to a cell – can start a cascade of repair. Since 10 percent of body weight is mitochondria, we should be feeding our mitochondria instead of shutting them down with drugs. What Is Ozone Therapy aka Ozonotherapy? Ozonotherapy is the use of medical grade ozone, a highly reactive form of pure oxygen, to create a curative response in the body. The body has the potential to renew and regenerate itself. When it becomes sick it is because this potential has been blocked. The reactive properties of ozone stimulate the body to remove many of these blockages thus allowing the body to do what it does best – heal itself. · It activates the immune system in infectious diseases. · It improves the cellular utilization of oxygen that reduces ischemia (lack of blood flow) in cardiovascular diseases, and in many of the infirmities of aging. · It causes the release of growth factors that stimulate damaged joints and degenerative discs to regenerate. · It can dramatically reduce or even eliminate many cases of chronic pain through its action on pain receptors. What is ozone and how does it heal? Oxygen as you know it makes all life possible. It’s the molecule from which all cellular energy, and thus function and healing, is derived. What you may not know is when “activated” through an ozone generating machine, oxygen turns from O2 (oxygen) into O3 (ozone). Ozone contains three oxygen atoms, which react in the tissue as it breaks down to ordinary oxygen (O2) and a reactive singlet oxygen molecule that can combine with chemicals and other molecules. Free from side effects, this is an extremely safe therapy that works in a number of ways. 1. It puts “extra” oxygen in diseased, cancerous, inflamed or infected tissue. Typically, these areas are low in oxygen, thereby decreasing the chances for healthy cells to survive and/or defend themselves. Upon injecting ozone into the bloodstream or a tumor, the O3 molecule breaks down again into oxygen (O2) and an oxygen atom (O1). The O2 increases oxygen in these areas, greatly boosting the body’s healing powers. 2. The third oxygen atom (O1), meanwhile, negatively affects abnormal cells (such as cancer cells) as well as pathogens like bacteria, yeast, fungus and viruses. This ozone breakdown creates what is called a “free radical” – in this case the O1 atom. This free radical breaks through the outer “wall” that surrounds an abnormal cell or pathogen. Normal cells have a way of protecting themselves against this effect (via mitochondria), so normal cells get a boost of oxygen to help them heal, while abnormal cells and pathogens have their “walls” broken and die. 1. Decreasing inflammation. Where there is inflammation, swelling, bruising, infection, cancer and trauma to the tissue, there are higher amounts of carbon dioxide within the tissue. This increase of carbon dioxide contributes to inflammation and pain. Increasing the amount of oxygen delivered to the tissue in the form of reactive ozone decreases inflammation, pain and swelling, and helps increase healing. 2. Activating the immune system. 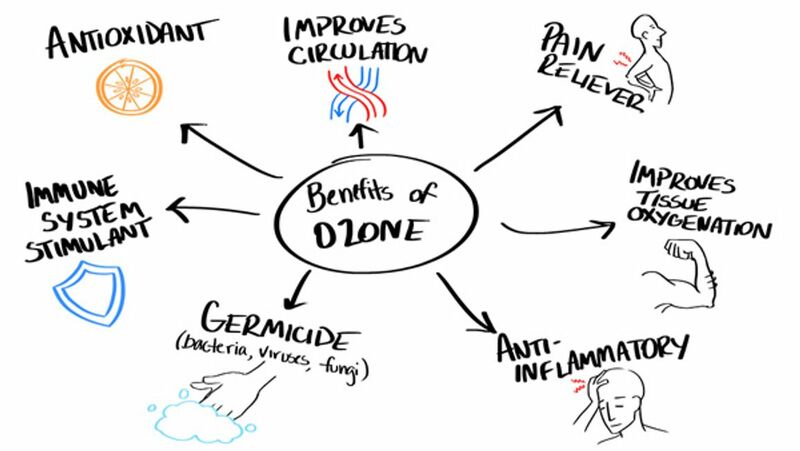 Ozone therapy has also been shown to activate the immune system by stimulating cytokine production. Cytokines are “messenger cells”, such as interferons and interleukins, which “set off a cascade reaction of positive changes throughout the immune system.”(t). Ozone also promotes the production of glutathione peroxidase, catalase, reductase and super-oxide dismutase, the enzymes forming the cell wall coating; thereby enhancing cellular immunity. 3. Inactivating bacteria, viruses, fungi, yeast and protozoa. Healthy cells are surrounded by an enzyme coating, which ozone does not penetrate, but bacteria and viruses have no such coatings. Ozone therapy disrupts the integrity of the bacterial cell envelope through oxidation of the phospholipids and lipoproteins (peroxidation). In viruses, this peroxidation disrupts the reproductive cycle and damages the viral capsid. In fungi, ozone inhibits cell growth. Consider chronic otitis, which often has multiple organisms as primary or secondary invaders; this explains the efficacy of ozone treatment.